Once again, Arrow fans were treated to an explosive 'mid-mid season finale.' 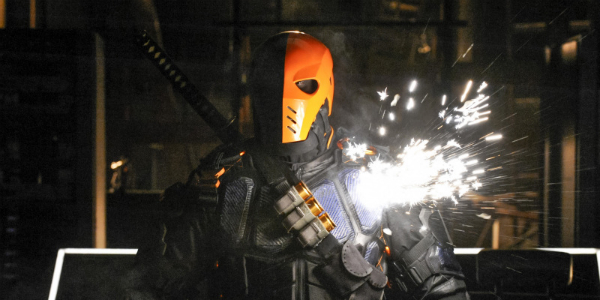 Or was "Deathstroke" the superhero series' 'mid-mid-mid-season finale?' It's hard to keep track with all these cliff-hanging breaks in The CW's schedule for Starling City's crime-fighter. Ever since meeting "The Scientist," Arrow has struggled to show up each and every Wednesday and next week will be another night off. But it's also the last one before the final four episode stretch. Like I said, a mid-mid-mid-season finale. Of course, it's hard to complain about the brief gaps when every new cycle manages to outdo the previous three or four episode stretch. And the most recent run, summed up nicely with the 'Full Circle' spot, was no exception. In just the last few weeks, fans got to see the origin of the "Suicide Squad," the "Birds Of Prey" and now, "Deathstroke." Since we're already talking about origins, it's only fitting to start the discussion of the DCU references in "Deathstroke" with the action unfolding on Lian Yu. The flashback sequences picked up right where last week left off as (now Captain) Slade continues to negotiate with Sara for the return of Hendrick, the only castaway capable of fixing the Amazo. This season's time spent in the past has probably been more about Sara and Slade's respective origins than Oliver's and this episode finds our Canary starting to get scary. Well, according to Anatoli Knyazev anyway, who happens to be her most trusted ally at the moment. The two come up with a plan to not only get Ollie back but also kill Slade, however, the latter can smell the TNT trick a mile away thanks to the mirakuru. Why doesn't the super-mercenary just kill them all right then and there? Or at least take them prisoner to continue the torture? He's got a sinister Shadow whispering orders in his ear. Oh, and 'Team Lian Yu' also gained the now one-armed Dr. Ivo. Great. The second season of Arrow has spent a considerable amount of time expanding the 'Team,' consistently making the strength in numbers argument, and Slade wisely starts his attack by tearing them apart. It turns out that taking Thea was really just the first of many distractions that the big bad has planned for Oliver and he's more than happy to let Speedy walk out the front door once the damage has been done. The damage? Well, the Team's decision to use the Tibetan Pit Viper venom (a favorite of The League of Shadows, especially Nyssa al Ghul) to take Deathstroke down... town. Weak. This not only puts Detective Lance in cuffs but the delay also causes Roy to rage, stop training with his hero and hightail it out of town (in his mobile) once he knows his former girlfriend is safe. No police connection and no super-sidekick, who's next? At least Arrow still has Dig, Felicity and the Canary in his cave. For now. Deathstroke didn't just do a fine job getting rid of a few adversaries but he also officially earned his nickname. And he approves. Captain or General Deathstroke might be more appropriate since he's about to have an entire army at his disposal after hijacking a D.O.C. bus from Iron Heights Penitentiary. To be fair, his posse was already pretty impressive with Sebastian 'Brother' Blood and Isabel Rochev at his side. Yep. Rochev. Who would have guessed she was bad except, you know, everyone! Rochev used Deathstroke's misdirection in order to become CEO of Queen Consolidated and immediately put Applied Sciences (apparently every large corporation has one) to work on making super-soldiers. I'm still not on board with the theory that she's Talia al Ghul because we've already met her family and this seems completely separate. I could be wrong but I was right that Thea would find out that Malcolm Merlyn was her real father this week. Now I'm starting to wonder if she could go the Merlyn route instead of being Speedy. The big bad's plans also have a (possibly) unintended effect on the Starling City elections though, with Moira looking more sympathetic to voters. And even her son. Deathstroke mended relationships to break them? He's not that good is he? He does have me wondering if D.A. Kate Spencer is also on his side. We'll see who's side Laurel is on now that her father's been arrested and she knows who's "The Man Under the Hood." 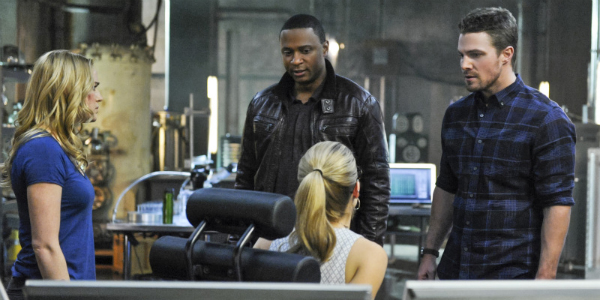 Arrow returns with Episode 19, "The Man Under the Hood," on Wednesday, April 16 at 8 p.m. ET on The CW. Created by Marc Guggenheim, Andrew Kreisberg and Greg Berlanti, the DC Comics inspired series stars Stephen Amell, Katie Cassidy, David Ramsey, Emily Bett Rickards, Willa Holland, Colton Haynes, Manu Bennett, Paul Blackthorne and Susanna Thompson.